On September 5-6, 2017, the seven members of the Commission for the Union of the Provinces of St. Nicholas and St. Augustine gathered at the Provincial Residence, St. Cloud Monastery, West Orange, New Jersey, for its second meeting. The first meeting was held in April of this year. The Prior General, Fr. Miguel Miró, OAR, led the discussions. Fr. John Michael Rafferty, OAR, Prior Provincial of St. Augustine Province, was joined by Fr. Fredric Abiera, OAR, and Fr. Marlon Beof, OAR, to represent St. Augustine Province. Fr. 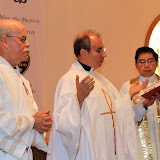 Sergio Sánchez, OAR, Prior Provincial of St. Nicholas Province, was joined by Fr. Rafael Mediavilla, OAR, and Fr. Benjamín Miguélez, OAR, to represent St. Nicholas Province. The commission discussed and confronted various issues related to the planned union of both provinces to pave the way for an ordered Provincial Chapter in May of 2018 and for a smooth transition to a unified province. The day after the meeting, Fr. General, accompanied by Fr. Sergio, Fr. Rafael, Fr. Benjamin, and Fr. Fredric, visited Tagaste Monastery, Suffern, New York, to meet with Fr. John Gruben, Fr. John Oldfield, and Fr. Fidel Hernández. After spending the morning at Tagaste Monastery, they joined the community of St. Nicholas Monastery, Union City, New Jersey, for lunch. Fr. Rafferty and Fr. Beof were also present at the gathering in Union City. Members of the Commission for the union of both provinces. Members of the Commission with the community of St. Nicholas Monastery, Union City, New Jersey. St. Augustine of Hippo and St. Nicholas of Tolentine... together!